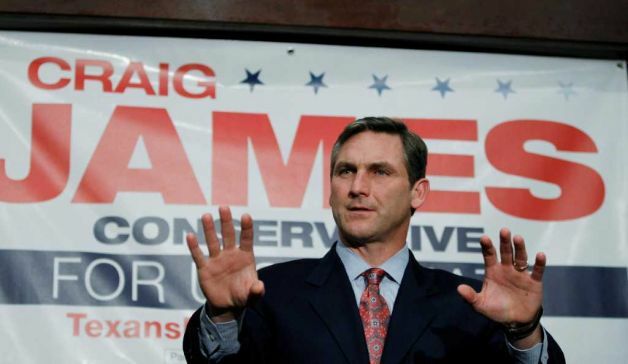 Craig James, what a guy. Crappy college football analyst who conspires to get a coach fired because of his whiny kid being a little wiener and the coach takes none of it. Classic. Now he's running a spirited, but predictably terrible, campaign for the United States Senate. So he decides to tackle the elephant in the room, as his daughter puts it, the Texas Tech case. Of course, James sidesteps the whole thing and talks about how he will always step up for his family from a bully, like he says Mike Leach was, just as he will do for Texas. That would be like scheming to get America taken over by China because it disrespected Texas (and yes that was a terrible metaphor). Let's go to the videotape. I can't help but shake my head.